A week ago, in Japan: Large Aichi Farm Hit With CSF - Exported Pigs To 4 Other Prefectures, Japan's Maff (Ministry of Agriculture, Forestry, and Fisheries) reported on the first CSF infected farm in Aichi Prefecture - which lies adjacent to Gifu Prefecture where 7 other farms have been struck since last September. The farm, in Toyota City, has recently shipped pigs to other farms in 4 prefectures, prompting the culling of thousands of pigs. Today MAFF announced a second farm in Aichi - epidemiologically linked to the Toyota City Farm - has tested positive for the pig disease. While often clinically indistinguishable from African Swine Fever (ASF), Classical Swine Fever (CSF) is caused by a different virus (genus Pestivirus, family Flaviviridae). Both diseases are highly contagious among pigs, and can be economically devastating for pork producers, but neither disease poses a direct human health threat. 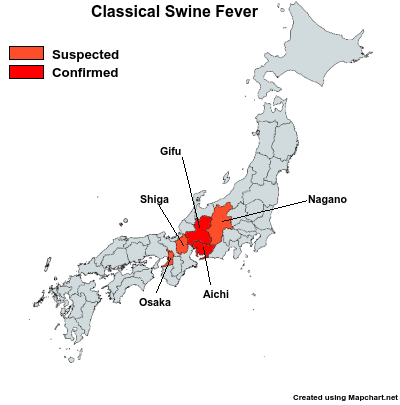 Today, suspected affected animals of swine fever has been confirmed in a pig farm in Aichi Prefecture, Tahara. (1) Aichi Prefecture, February 12 (Tuesday), it takes the movement restriction as there is a risk that has been infected with swine fever for which there is epidemiological related to the occurrence farm of Toyota City, Aichi Prefecture, placed under surveillance from Aichi Prefecture, Tahara of pig farms had received reports of the admitted abnormality of death, such as in feeding pigs, animal health inspectors have conducted a site inspection. (2) where Sampling material by using a central Livestock Hygiene Service Center has performed a thorough examination, today (February 13, Wednesday), it is suspected affected animals of swine fever has been confirmed. On the basis of the "specific livestock epidemic quarantine guidelines for classical swine fever", and taken all possible measures for the following quarantine measures, and the like. (1) The farm breeding pigs slaughtered and baked burial, and carried quickly and accurately quarantine measures necessary for setting of the movement restriction zone. (2) for the farm of movement restricted area, it will be carried out as soon as possible occurrence status check inspection. (3) Since the spread of infection prevention, strengthening the disinfection of peripheral generation farm, we set up a disinfection point to the main road. (4) for the investigation of such infection route, and dispatch the epidemiological investigation team of the country. (5) aims to ensure the early detection and early notification of the disease. (6) strive to relevant ministries and sufficient cooperation, producer, consumer, we will endeavor to provide accurate information to the distributors and the like. (7) thorough guidance on compliance with the Standards of Rearing Hygiene Management of intrusion prevention, etc. to the farm disinfection and wild animals of the farm. (8) In order to investigate and prevent the spread of such infection route, it will assume all the possibilities investigation. (1) pig cholera, swine, is a disease of wild boar, it does not infect humans. In addition, it does not meat of infected pigs on the market. (2) the farm, you have to refrain from the movement of breeding pigs from the time the suspicion of swine fever has occurred. (3) interview in the field, thank you for your cooperation as strictly refrain from such that there is a risk that cause the spread of the disease. In particular, for coverage of using a helicopter that might interfere with the epidemic prevention work, thank you so strictly avoided. (4) in the future, so we will endeavor to provide quick and accurate information, so as not to be confused by such relations of production and consumers, such as who is unfounded rumor, thank you for your cooperation. 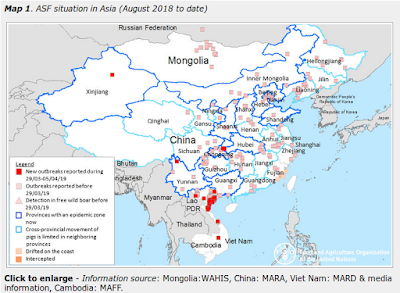 Meanwhile, the African Swine Fever news out of China has all but dried up - with only one outbreak reported (in Yongzhou City) over the past 3 weeks. Whether that is truly reflective of the situation on the ground is anyone's guess.